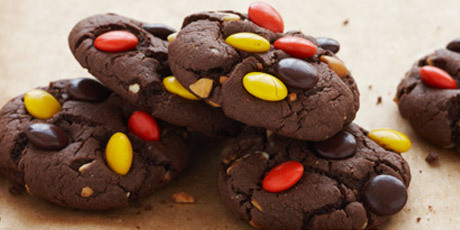 Duncan Hines Moist Deluxe Devil's Food Cake Mix jam-packed with candy-coated peanut butter pieces, kids and kids-at-heart will love and devour these Chocolate Peanut Butter Cookies. 1. Preheat oven to 350 ºF. Grease cookie sheets. 2. Combine cake mix, peanut butter, eggs and milk in large mixing bowl. Beat at low speed with electric mixer until blended. Stir in peanut butter pieces. Drop dough by slightly rounded tablespoons onto prepared cookie sheets. 3. Bake 7 to 9 minutes or until lightly browned. Cool 2 minutes on cookie sheets. Remove to cooling racks.